MILWAUKEE, WI. 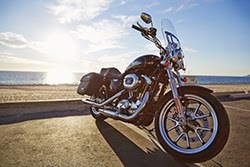 (March 6, 2014) – Harley-Davidson® (NYSE:HOG) is at it again. Fresh off the unveiling of the new Harley-Davidson Street™ 750 and the launch of Project RUSHMORE, the company unleashed today two new motorcycles that expand its diverse line-up of street bikes, and put more models for more riders on the showroom floor of each Harley-Davidson dealer. The mid-year release of the retro-cool Low Rider® and rangy SuperLow® 1200T completes the largest new-model launch in Harley-Davidson’s 110-year history and keeps the throttle pinned on the company’s accelerated, customer-led product-development process. Low Rider In 1977, Harley-Davidson created a ride-it-hard, put-it-away dirty, make-your-own-boundaries custom motorcycle that became an icon — the Low Rider. Today that defiant attitude returns with a vengeance as the legendary Low Rider model name is reprised for an all-new cruiser that rolls with old-school class and exciting new performance. A polished headlamp visor, wrinkle black trim, and split five-spoke aluminum wheels are touchstone styling elements from the original Low Rider model. The unrelenting thrust of the Twin Cam 103™ powertrain signals departure with a satisfying, throaty tone through twisting header pipes feeding a 2-into-1 exhaust. Suspension is calibrated for all-day comfort and precise handling, while dual-front disc brakes deliver capable stopping power. The new adjustable seat and handlebar risers enable a perfect fit for more riders. Ample Genuine Motor Accessories offer endless possibilities for self-expression, so any rider can own the look and own the road. SuperLow 1200T Harley-Davidson opens the door to touring adventure with the SuperLow 1200T, a motorcycle that combines a nimble chassis with essential touring features and the power to ride to the horizon. A detachable windshield, locking saddlebags and Michelin® Scorcher™ 11T touring tires are standard equipment. Docking points accommodate detachable accessory racks and backrests for ease of customization. A new seat and control ergonomics are shaped specifically to give more riders long-distance comfort. 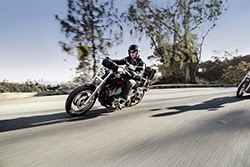 The SuperLow 1200T can run with the pack thanks to the power of a 1200cc Evolution® V-Twin engine, and it weighs 118 pounds less than the lightest Harley-Davidson Big Twin touring motorcycle. The finish is premium Harley-Davidson with aluminum wheels, an available two-tone paint scheme and plenty of brilliant chrome. To swing a leg over a new Harley-Davidson motorcycle visit h-d.com to find a local dealer. The Low Rider and SuperLow 1200T models start arriving today in dealerships across the country, and are available to demo during Daytona Bike Week at the Harley-Davidson display at the Speedway.